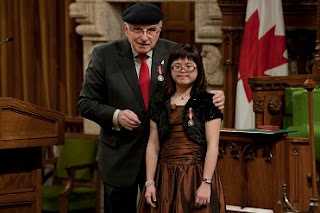 Ada Chan, was selected by her Member of Parliament Royal Galipeau (Ottawa-Orleans) to receive the Queen Elizabeth II Diamond Jubilee Medal. The ceremony was held on the floor of the House of Commons on January 25, 2013. Ada moved to Canada in 1996 where she joined Special Olympics Ottawa. She was selected to be one of the Down Syndrome ambassadors at the World Down Syndrome Congress in 2006 in Vancouver. Ada was the first Rhythmic Gymnast Special Olympian from Ontario to represent Canada at the World Summer Games (2003) . She received the Michael (Mike) McCool Sportsmanship Award/ Prix de l’esprit sportif Michael (Mike) McCool at the Kelly-Santini Festival Breakfast in October 2012 . Ada is a leader with the Ottawa Rhythmic Cats gymnastic team.